Gramercy Park is the name of both a small, fenced-in private park and the surrounding neighborhood that is referred to also as Gramercy. Its boundaries include 14th Street, First Avenue, 23rd Street and Park Avenue South, with two-acre Gramercy Park sandwiched between 20th and 21st Streets and Gramercy Park West and East. Stuyvesant Square goes from 15th to 17th Streets and Rutherford to Nathan D. Perlman Place. 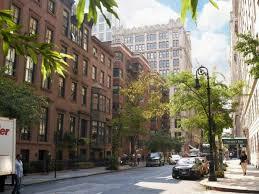 Gramercy Park is a calm residential area defined by diverse architecture. Zoning laws limit buildings to around 20 stories, preserving the three to four-story buildings that line Gramercy’s quiet, safe sidewalks. 1) The National Arts Club, which is located on 15 Gramercy Park South, is full of antique artworks that make some mystical atmosphere. They provide an array of wonderful exhibitions, book talks, movies, and offer an exquisite lounge for drinks, or just chilling after a long days work. 2) For some unwinding, visit Spin New York. It is a gaming and entertainment center located on 48 E 23rd St. Suitable for a younger crowd; there is an array of ping-pong tables and pool tables to enjoy with a bucket of beer. 3) Visit the People’s Improv Theater (PIT) on 123 East 24th Street. It is a full bar with red walls and black and white paintings. They are a comedy venue hosting nightly shows along with corporate workshops & classes in performance & writing.